Furukawa Hall, Sapporo, Japan is is one of Hokkaido University’s three designated Historical Buildings. Notable for its use of French Renaissance architecture, it now houses faculty members’ research rooms. The panorama was taken on the way to a lecture we gave to HitatchiSoft detailing the Virtual London model and the research in general featured in this blog. We would like to take this opportunity to thank the photographers and designers behind Panorama-Journey.com and Quicktime Brewery for coming along, both the sites are well worth a visit and feature some stunning panoramas. Thank you for the lecture in Sapporo. 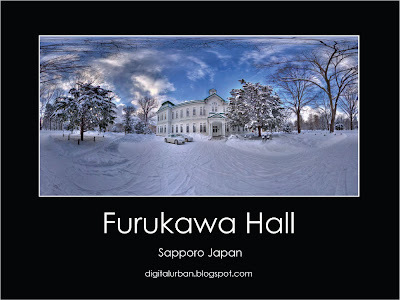 The panorama image of the Furukawa hall is very beautiful.